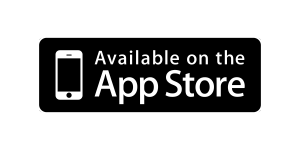 The American website Examiner.com published Russia’s top lies about Ukraine. In the recent years, the West has been largely oblivious to Russia’s propaganda machine, which managed to use its reach to create a league of clueless Putinistas the world over. The Ukrainian popular revolution shone the spotlight on the outright fabrications and despicable lies by Kremlin-controlled media, which strives to create an alternate reality for its audiences. This includes not only Russian mainstream media, but also hordes of paid trolls, who plague comment sections of articles about Ukraine and spread vitriol, hatred and blatant lies all over the social media. Here are top 20 of the most outrageous fabrications about Ukraine, which have been recently debunked. 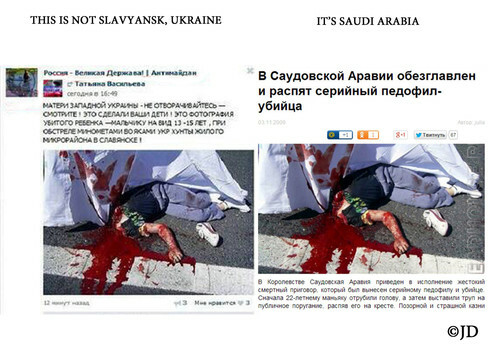 This photograph from Saudi Arabia was falsely represented as a picture from Slavyansk, Ukraine. 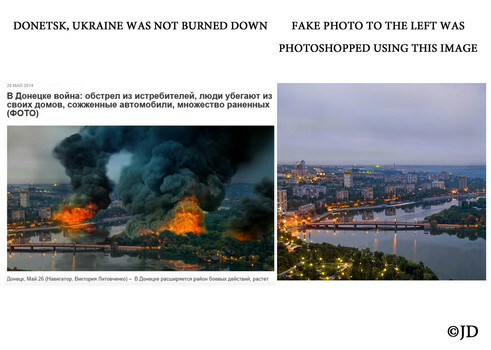 Photoshopped photograph, falsely claiming that Donetsk was burned down by the Ukrainian military. 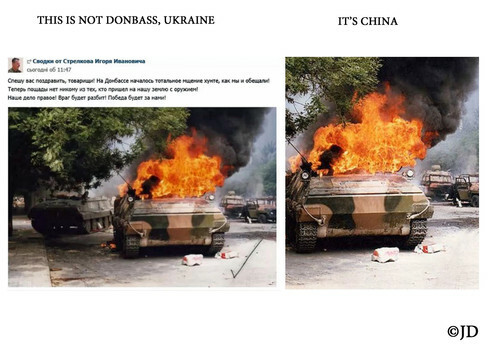 Photograph from China, which was falsely represented to be a picture from Donbass, Ukraine. 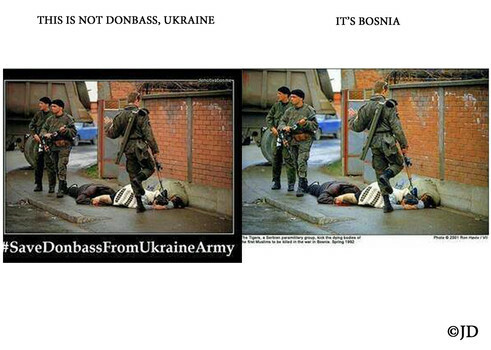 Photograph from Bosnia, falsely represented to show Ukrainian military abusing/murdering civilians in Donbass, Ukraine. 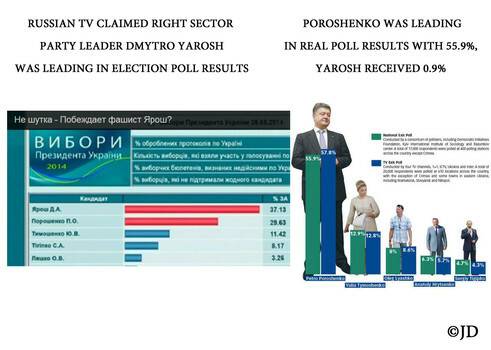 Election results shown on Russian television, falsely claiming that Right Sector leader Dmytro Yarosh was leading in the polls. 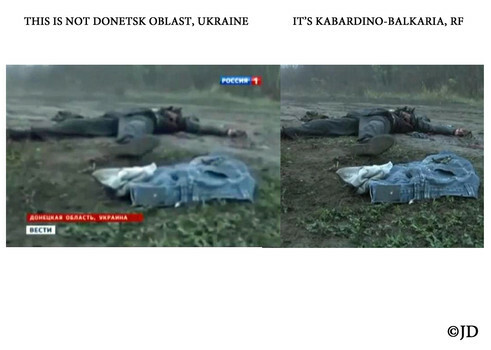 Video from Kabardino-Balkaria, RF falsely represented to have been filmed in Donetsk Oblast, Ukraine. 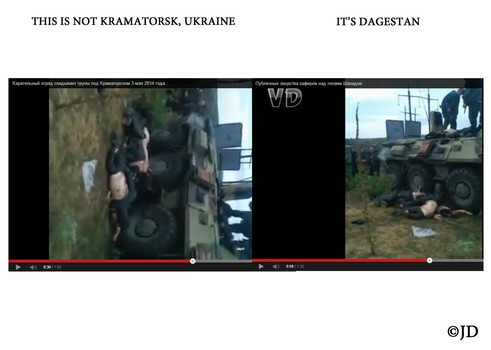 Gruesome video from Dagestan, which was falsely represented to have been filmed in Kramatorsk, Ukraine. 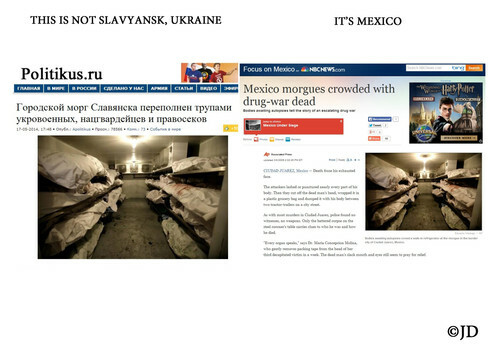 A morgue in Ciudad Juarez, which was falsely represented to be the city morgue of Slavyansk, Ukraine, allegedly filled with corpses of Ukrainian military men/national guard. 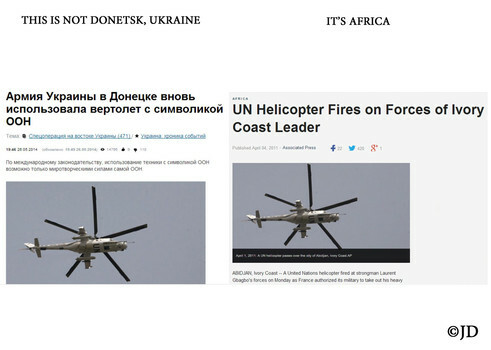 Photo of U.N. helicopters in Africa falsely represented to be a photo of the Ukrainian military using U.N. helicopters in Donetsk, Ukraine. 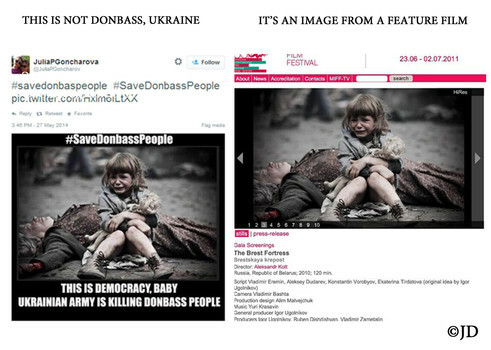 Photo from a feature film falsely represented to depict a real child, orphaned by the Ukrainian military in Donbass, Ukraine. 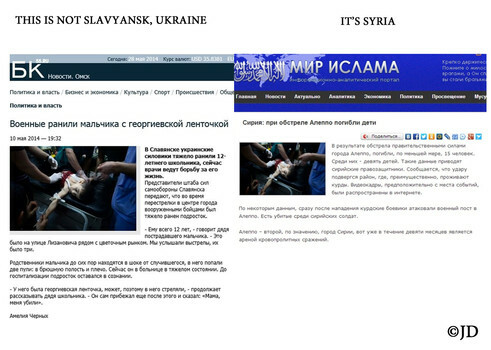 Photo of a child killed in Aleppo, Syria falsely represented to depict a child killed by the Ukrainian military in Slavyansk, Ukraine. 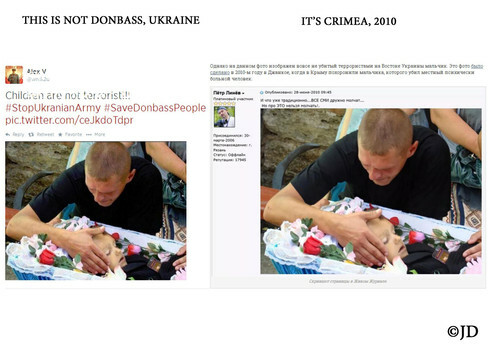 Photo of a child, murdered by a mentally ill person in 2010 in Crimea is falsely represented to depict a child murdered by the Ukrainian military in Donbass, Ukraine. 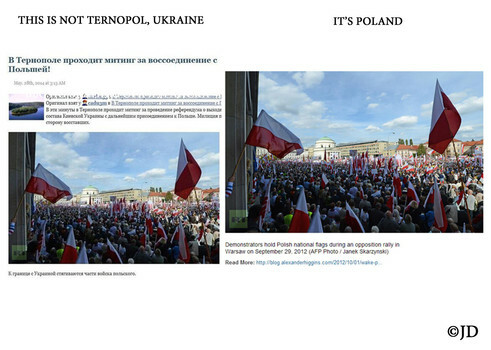 Photo of a 2012 demonstration in Poland falsely represented as a demonstration in Ukraine in 2014, demanding its annexation by Poland. 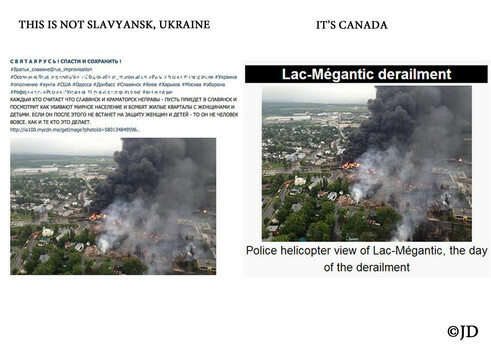 Photo of the Lac-Mégantic derailment in Quebec, Canada falsely represented as a photograph from Slavyansk, Ukraine. 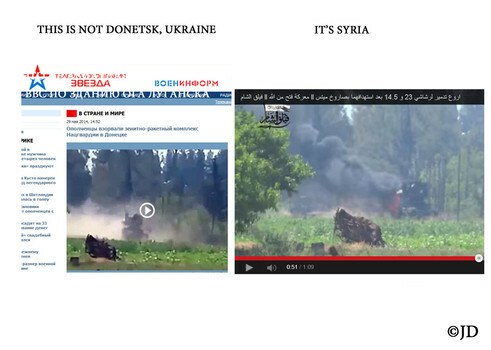 A video from Syria, which was falsely represented as a video filmed in Donetsk, Ukraine. 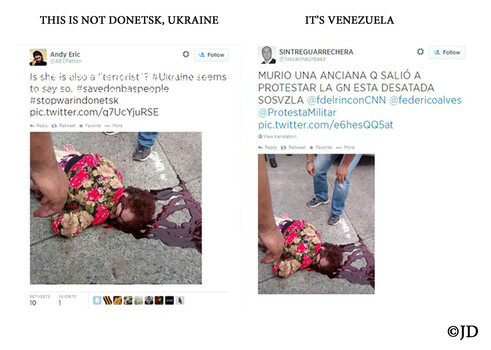 Photo of a woman killed in Venezuela falsely represented to depict a woman murdered by the Ukrainian military in Donetsk, Ukraine. 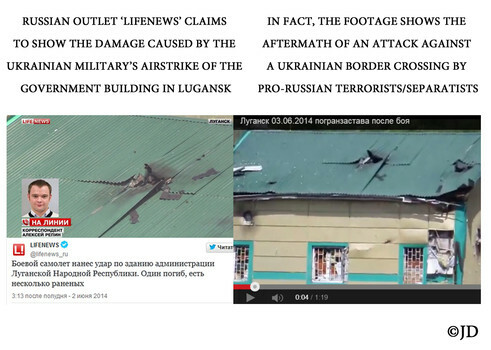 Footage depicting damage by pro-Russian terrorists/separatists to the border crossing station in Ukraine purports to show a government building in Lugansk, allegedly damaged by the Ukrainian government’s airstrike. Russian TV stations falsely claimed there was a mass exodus of Ukrainian citizens to Russian Federation. 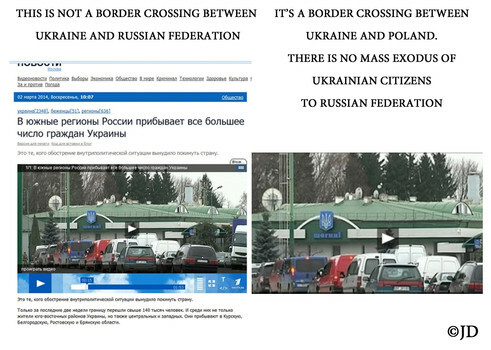 To corroborate their blatantly untrue statement, photos and video of a Polish border crossing with Ukraine were shown. This is not a Ukrainian drone shot down by pro-Russian terrorists/separatists. 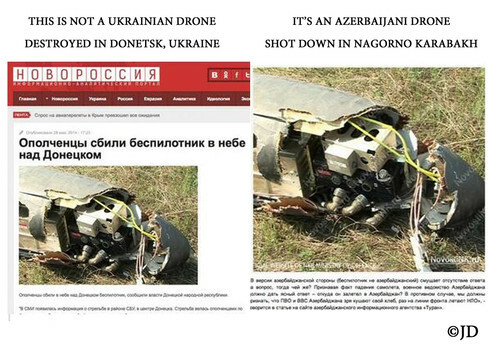 It’s an Azerbaijani drone, shot down in Nagorno Karabakh. 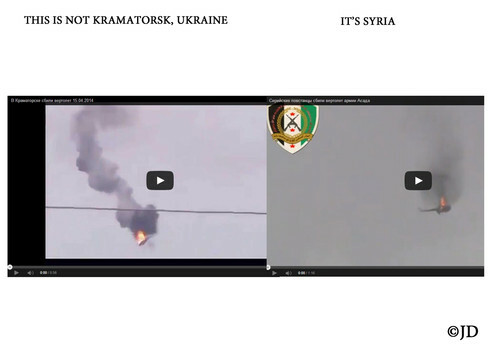 A video from Syria was falsely identified as the footage depicting pro-Russian terrorists/separatists downing a Ukrainian helicopter over Donetsk, Ukraine. By Julia Davis, Los Angeles Homeland Security Examiner. 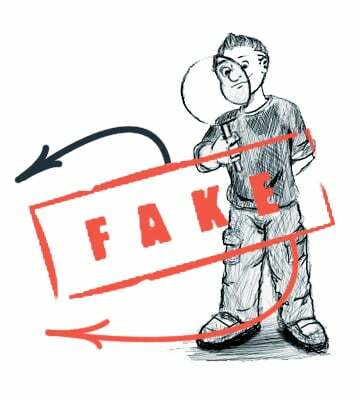 Let us remind you that most of these fakes have been already published on our website Stopfake.org.